1 Where exactly was the Hong Kong factory (if indeed in one location)? See below – rather confusing! 2 When did it operate from and ’til? Doug in a comment says, “The Hong Kong factory was put under supervision by the Hong Kong authorities but returned to him after this war.” ie WW1. 3 Are there any images of what went on inside the factory? It seems to have been very large and yet I can find none. 4 Mr Ingenhol. Did he actually live in HK and personally run this concern? One newspaper report from Feb 1916 says he “lives in Rotterdam and is a naturalised Belgian” though his brother was an admiral in the German Navy. 5 What did he look like? I cannot find a photo of him? The 1910 photograph below of “Cigar Factory Yaumatei” shows a very large operation extending off picture to the left. It does not immediately appear to match the Flickr images sent in by Mike T found below. However, the latter also show a chimney behind the main building which could be the building just visible in the background of the 1910 image. 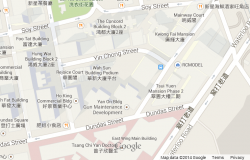 If so this was a very large operation covering an extensive area of Yau Ma Tei. 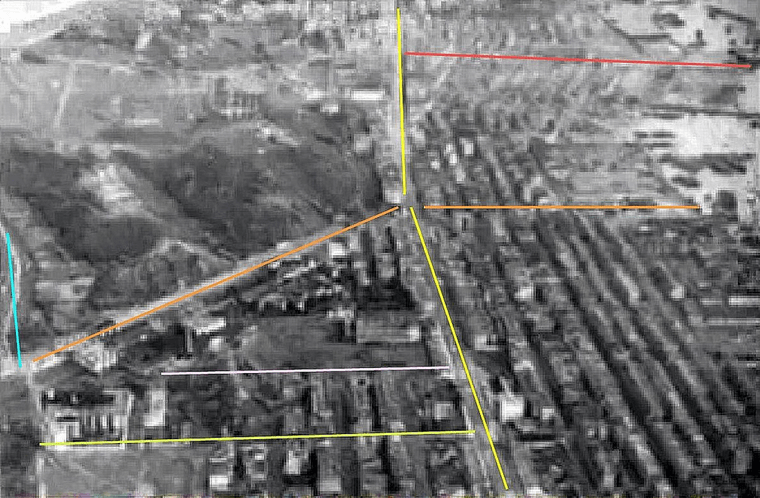 It certainly seems unlikely that there were two such operations in the area at the same time. Clarification of the exact location of this factory is needed. 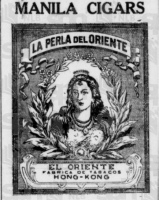 Anthony Lau asks if we have any information about Orient Tobacco Manufactory of Hongkong in a comment following the 9th Feb 2014 article Early HK Chinese manufacturers 1870s + around WW1. The short answer Anthony is no, in fact we have almost nothing on any company making cigarettes, cigars, tobacco etc here. So yes, the company was in Hong Kong. 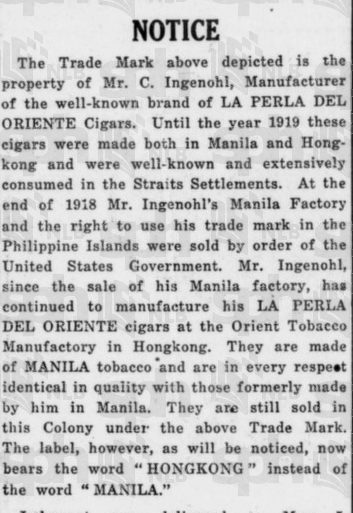 Signs of a Colonial Era, p100, mentions the Oriental Tobacco Company “owned by Ingenohl Ltd” . Unless someone can correct me I presume this is a mistake and the Orient name is right. 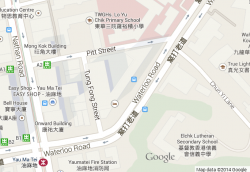 The book says that two Hong Kong streets are named after the (Oriental) Tobacco Company. Tung Fong (ie Oriental) Street and Yin Chong (ie Tobacco) Street. Mike T’s comments and images below confirm that the company was known as Orient. 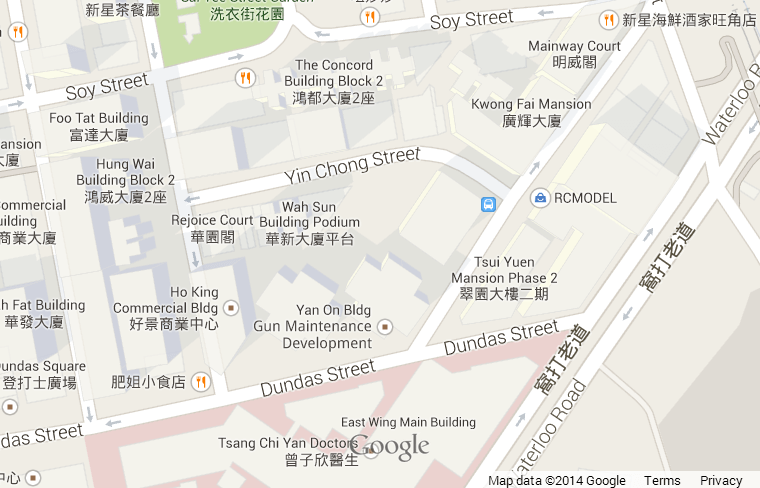 Tung Fong is very close to Yau Ma Tei MTR station. 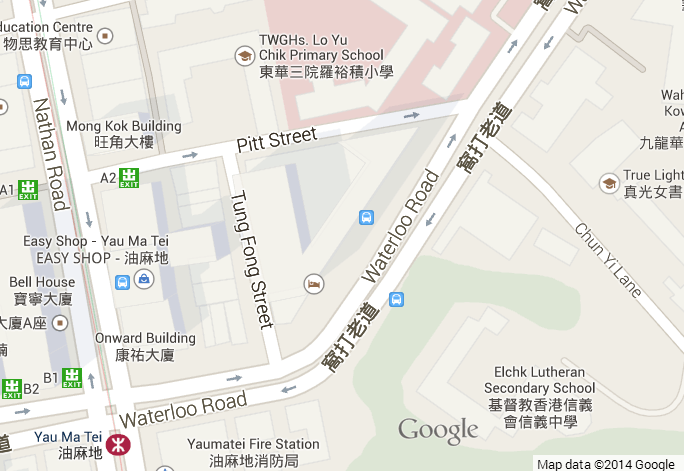 Yin Chong is behind the Kwong Wah Hospital off Waterloo Road. That is about 400 metres apart. Can anyone clarify whether this company was indeed located at either or both of these streets? And when? And confirm that the street names have been correctly translated? Mike T adds: Flickr found photos of the Orient Tobacco Manufactory and its land pre-WWII. You can see in the first photo that it is indeed Orient, not Oriental, at least at that time. The same name is also used in the Chamber of Commerce Members list from 1936 (page xxxiii), showing Orient Tobacco Manufactory / C. Ingehnohl Ltd. as a member since 1912. When and how did the piece of land, once belonged to the tobacco manufactory, split and a part become Kwong Wah Hospital ? Mike T: They seem to have lasted at least until WWII as there are multiple Swiss and Japanese library records dating to the end of the war and mentioning the company, specifically in relation to having been looted during Japanese occupation of the colony. That would probably mean the factory might have taken up the whole lot from the SW corner of Waterloo & Nathan up to the NE corner of modern day Soy Street/Kwong Wah Street/Yim Po Fong Street. I guess that’s ought to be something in GRO or Lands Department by checking out the deeds of the buildings in the area for clues. Thanks. I have inserted this information into the article as it clarifies the confusion over the company name. 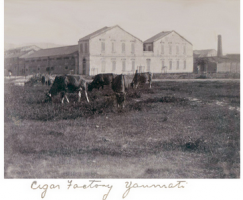 C. Ingenohl had two cigar factories. One in Manila and one in Hong Kong. 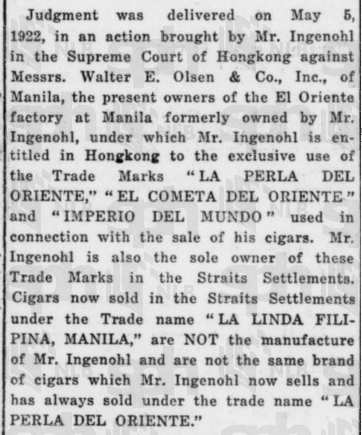 The Manila factory was seized by the American authorities during WWI because of his German connections. The Hong Kong factory was put under supervision by the Hong Kong authorities but returned to him after this war. Ingenohl wanted to get his brand back resulting in litigation in Hong Kong, Shanghai and Manila with appeals going to the Privy Council and Washington. The RPC report includes the original decision in Shanghai. This is valuable information about a man who clearly had several legal battles to fight in part at least because of his nationality (though I have seen a newspaper report that he was Belgian despite his brother being a German Admiral). 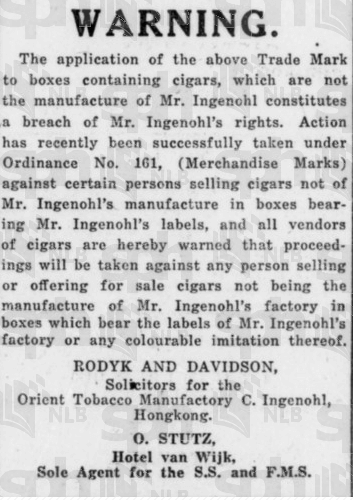 I have included your comment about his HK factory being put “under supervision” during WW1 in an updated article, Orient Tobacco Manufactury – many questions, any answers? I am Carl Ingenohl’s great-grandson. I do have photographs of him as well as a copy of a poster probably dating back to before the first World War, showing the factory, complete with chimney, as well as a few photographs of the factory dating back to the 1920ies. if you send me your email address, I would be happy to send these to you. 1) Carl Ingenohl emigrated to Antwerp in 1876 and lived there until his death in 1934. He took Belgian nationality before the first World War and his house in Antwerp was requisitioned by the Germans during WW I, so he suffered from the German occupation along with all the other Belgians. He never lived in Rotterdam. 2) The factory was located on a site totalling 307,000 sq ft bordered by Dundas Street, Nathan Street, Soy Street and Kwong Wa street, not very far from what is today Mong Kok station. There may have been an administrative office and sales operation in the center of Hong Kong, but there was certainly no other factory in Hong Kong. 3) While he lived in Antwerp, Carl Ingenohl traveled regularly to Hong Kong and Manilla and managed the operations very hands on during his lifetime. 4) While most but not all the management were of German origin, some may have taken Belgian nationality as did Carl Ingenohl himself. Supplies were most unlikely to have been sourced from Germany. Firstly because that would have been uneconomical, which was contrary to Carl Ingenohl’s business priciples, but if they had been sourced from Europe, they would have been sourced from Belgium where the operational headquarters were, not from Germany. I agree that the article that refers to that is not only incorrect, but also biased by the understandable anti German sentiment of the time, in this case misdirected. 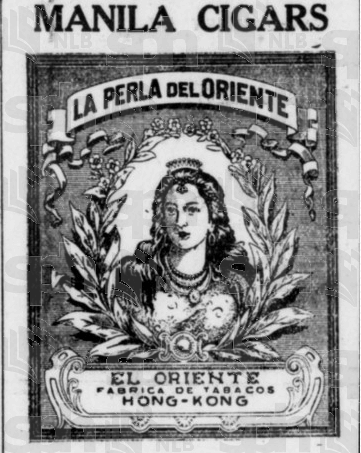 5) El Oriente was mostly a trade name, although it did appear in various names of companies in the group. The parent was a Swiss partnership of which Carl Ingenohl was the General Partner (and principal partner) and that partnership owned the Hong Kong company, the Manilla company (until 1914) and the Antwerp company. The Spanish name is due to the fact that the industrial activity was started by Carl Ingenohl in Manilla, where the group owned plantations and a factory. The Hong Kong factory was built in the New Territories I believe in 1908-9. 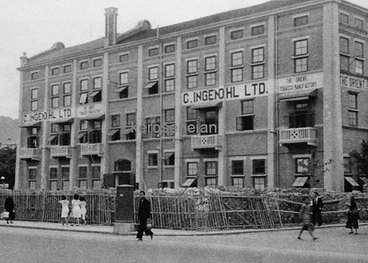 The name of the company was Orient Tabacco Manufacture Carl Ingenohl Ltd as is clearly shown in the document about the trademark litigation above and on the second photograph of the factory above. I do not think the first photograph above is actually of the Ingenohl factory. 6) The Manilla operations were indeed (wrongly) confiscated by the Americans because Carl Ingenohl’s brother had been the admiral in charge of the German European fleet until 1915. 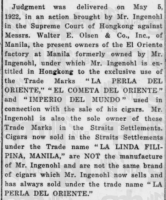 By the time Carl Ingenohl won his case to recover the Philipine assets in front of the US Supreme Court ten years after the end of WW I, the company to which the assets had effectively been given had gone bankrupt, so he recovered nothing in spite of having won in court. 7) I do not have any photographs of the inside of the factory, but I do have a plan of the factory, which was indeed substantial. 8) The Hong Kong factory was probably in operation until the outbreak of WW II. The site was sold for property development in the first half of the 1950ies. Thank you for your post. I would be very interested in having a photo of Carl Ingenohl. I am just about to publish a book on the British Supreme Court for China which heard one of the cases between Ingenohl and Olsen & co. One chapter deals with the case and the related cases in Hong Kong and Manila. I would love to publish a photo of Carl Ingenohl if you could provide one. My email address is doug@douglas-clark.com.